The sonic wall is a papered and whitened aall sized 6 m x 2,30, that is embedded in a room. Its visually hardly noticable as object, but actually is a 5 channel sound reproducer. The installation is especially configured for low frequence sounds between 40 - 60 hz, the selfresonance frequence of the wall. The sonic wall is a room installation which transfers music from an mainly acoustic to a haptic perception. While leaning on the wall, the sound can be felt, not mainly heard. The sonic wall derived from a composition idea by the artist about the reverb of unspoken words. Traces of the unspoken is based on field recordings taken of the moment, when a person prepares to speak, but doesn«t finally speak out loud. This unspoken words leave a trace, a reverb, which is manifested in the wall as a hardly hearable sound, that can be felt as a strong vibration. The audio material was taken from more than 20 interviews and dialogs. The object was also free to compositors, which want to work conceptionally with the facilities of this situation of reception between haptic and acoustic Perception. Also Daniel Lercher, Matija Schellander, Angelica Castello, Ye Hui, Kaoko Amano, Katrin Hauk, Steffi Neuhuber, Gobi Drab, Veronika Mayer, Michael Zacherl und Onur Dülgur worked with the sonic wall. 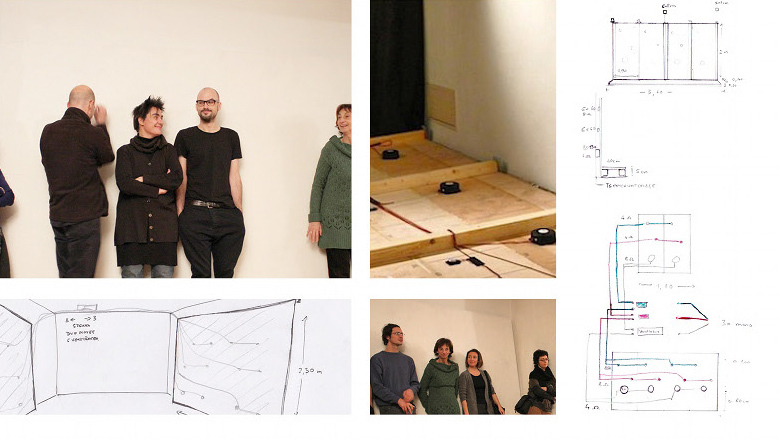 The Sonic Wall was a project with snim - network for improvised music, and was installed as a permanent installation for one year at the Echoraum, Vienna, 2011 - 2012.